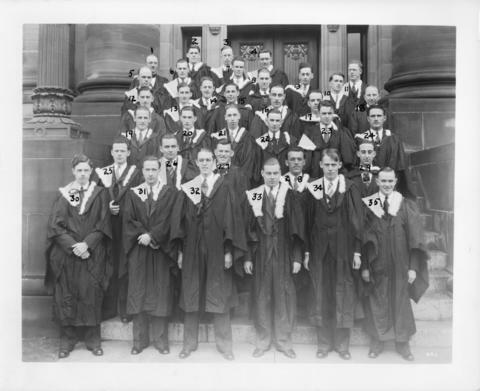 Item is a photograph of a graduating class from the Nova Scotia Technical College from an unknown year. The photograph shows O. B. Berringer; A. Miller; C. MacDonald; M. Barrett; J. H. Grant; O.N. Mahen; J. Howley; W. Graham; M. Fishman; R. Carey; R. L. Norman; C Sargeant; R. Shatford; D. Blane; R. Fraser; C. Murray; C. Wright; J. Ryan; J. Critchley; C. Knight; F. Skerry; W. Walsh; L. J. Whalen; J. G. Thompson; J. R. Carson; R. L. Doucett; G. Burlton; R. Moores; B. Cain; G. A. White; W. J. Gent; G. A. Blackburn; M. A. Wortman; E. R. Jones; and G. G. Hamilton standing on the front steps of a building and wearing academic dress. The photograph is accompanied by a numbered list of people shown in the photograph, which correlates to the numbers written on the photograph.